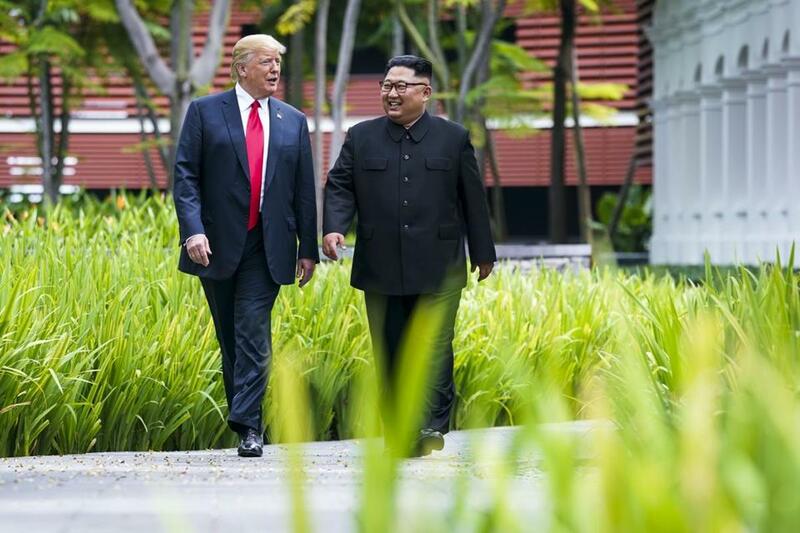 President Trump and Kim Jong Un, the leader of North Korea, walked together in Singapore. SINGAPORE — On paper, there is nothing President Trump extracted from North Korea’s leader, Kim Jong Un, in their summit meeting that Kim’s father and grandfather had not already offered to past American presidents. In fact, he got less, at least for now. But as Trump made clear in a lengthy but vaguely worded reconstruction of their five hours of talks, none of that really matters to him. Instead, he is betting everything on the “terrific relationship” and “very special bond” that he said he developed with the 34-year-old dictator, and Trump’s seeming certainty that they now view the future elimination of North Korea’s arsenal of atomic weapons the same way. He swatted away suggestions that the phrase “complete denuclearization of the Korean Peninsula” means something different in Pyongyang than it does in Washington. Trump may yet prove that this time is different. This entire venture in the steamy summer in Singapore, the beating capitalist heart of Southeast Asia, is based on his conclusion that past presidents got it backward. So he flew halfway around the world to meet the leader of one of the world’s most repressive nations on the theory that if he could win over the country’s leader with a vision of future wealth, North Korea will determine that it no longer needs its nuclear weapons. Or its missiles, its stockpiles of VX and other nerve agents, or its biological weapons. It is a huge gamble, based on the very Trumpian assumption that the force of his personality, and the deal-making skills in which he has supreme confidence, will make all the difference. Skeptics doubt that anything basic has changed and that a regime that has survived chiefly on its ability to threaten Armageddon will be reluctant to give up everything. Trump says he has no doubt that Kim has made a strategic decision to give it all up. After all, Kim took an admiring walking tour of the Singapore night life on Monday night, and Trump was not exactly subtle in suggesting that Pyongyang could soon take the same development path — if only Kim traded that future for his weapons. “I think, honestly, I think he’s going to do these things,” Trump insisted. “I may be wrong. I mean, I may stand before you in six months and say, ‘Hey, I was wrong.’ ” He paused a moment, realizing how out of character that would be. History might give him pause. Trump says he spent time studying past negotiations, so he might have discovered that North Korea agreed to hot lines and arms pullbacks with South Korea in 1992. It agreed to halt plutonium production with the Clinton administration in 1994. In 2005, it committed, with the Bush administration, to “abandoning all nuclear weapons and existing nuclear programs and returning at an early date to the treaty on the nonproliferation of nuclear weapons” and to International Atomic Energy Agency safeguards. That was far more detailed than anything Kim signed on Tuesday. The Bush administration argued, as Trump has also done, that the skeptics needed to entertain the possibility that North Korea had reevaluated its interests and no longer saw nuclear weapons as a form of protection. Since then, the North has held six underground nuclear tests, expanded its production, barred inspectors, and conducted countless missile tests. No wording that specific appears in the document Trump signed with such fanfare at the Sentosa resort island. While all summits are a mix of pageantry and policy, this one was long on ceremony. He was right, and at moments it looked as if it had been drawn from one of the many dark comedies built around the North Korean leader, such as “The Interview,” which imagines a plot to kill him off. The North responded to the film with a major cyberattack against Sony Pictures. There were no commitments in Tuesday’s document about limiting Kim’s growing cyberarmy. Yet even some of Trump’s fiercest critics, who say he is dismantling alliances and wrecking America’s reputation for sticking to its agreements, have applauded the effort. “We’re in a better place today than we were a year ago,” Antony J. Blinken, who was deputy national security adviser and deputy secretary of state under Barack Obama, said after the meeting ended. It was worth trying the top-down approach to dealing with Kim, he went on, because the alternative path has failed repeatedly. The first test of that theory may come as soon as next week, when Secretary of State Mike Pompeo is supposed to begin translating the vague set of commitments signed on Tuesday into something that resembles a disarmament plan. While the White House used to describe those moves as rapid, Pompeo has privately acknowledged to aides and friends that this will be a long process. He insists, as Trump did on Tuesday, that the United States will not let up on sanctions against the North until the disarmament process is well under way in order to maintain leverage. But the reality is more complicated. The United States has little trade with North Korea that it can impose sanctions on. And China and Russia are already letting up the pressure because, in their view, as long as Kim has Trump engage in diplomacy, the president cannot threaten fire, fury, or a willingness to use what he once called the “bigger button” on his desk. “The summit has changed the psychology of the nuclear crisis and thereby pushed off the prospect of preventive US military action,” said Robert Litwak, a Wilson Center scholar who published a study of negotiating with North Korea. But he warned that Trump is not walking into the kind of negotiation he thinks he is. “The upcoming negotiations will be arms control to constrain the North Korean program, not disarmament to eliminate it,” Litwak said. The supreme irony, as Litwak and others noted on Tuesday, is that an effort to constrain the North’s capabilities, rather than eliminate them, has shades of the Iran deal that Trump just rejected. If Trump allows this negotiation to become about limiting the North’s capabilities, rather than eliminating them, he will repeat the moves that he castigated Obama for making in Iran. If he insists on getting it all — “complete, verifiable, irreversible denuclearization,” he risks coming up empty-handed. Whatever he gets, it will be judged by one standard: whether he has “solved” the North Korea problem, as he vowed he would, rather than passing it on to his successor.